If you fancy having a wee dance with locals and visitors alike, you should come along to a ceilidh. There's no need to know the dances as the caller will talk you through the steps. The idea is to enjoy and celebrate and not be too formal. Ceilidh means a gathering and would refer to any occasion, special or otherwise, where people would get together and enjoy a dance or celebration. These days many Scottish people will take part in a ceilidh at weddings, New Year or Burns Night but you don't need an excuse. There are regular informal ceilidh nights to be had around Scotland. Do you know of any ceilidhs in your local area? 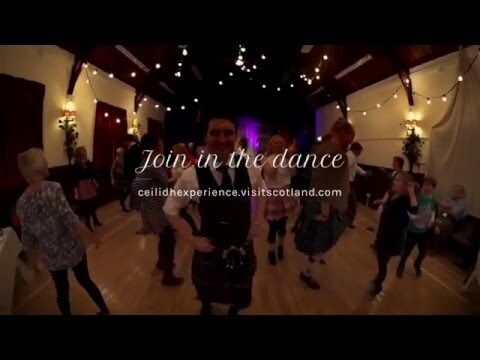 Would you like to know if there are any ceilidhs where you are visiting? The Skipinnish Ceilidh House in Oban holds regular "Ceilidh Shows" showcasing Scottish music, bagpipes and of course a ceilidh for everyone to get involved in.